Premiering at PulpFest. . . This year at PulpFest we’ll be premiering our latest two volumes. Both are from the pen of Donald E. Keyhoe, noted aviator, author, and ufologist. In 1931, Keyhoe created a number of long-running characters for as many aviation pulps. There was Philip Strange in Flying Aces; The Devil Dog Squadron in Sky Birds; and The Jailbird Flight for Popular Publication’s Battle Aces. With The Jailbird Flight: Dead Man’s Drome, we reprint the first seven stories of Keyhoe’s condemed suicide squadron that ran in Battle Aces in 1931 and ‘32. Hand picked from the bowels of Blois, saved from a living death, outcasts—all of them—branded with the convict’s arrow. Braving danger with the recklessness of men who know they are doomed to die! They are dishonored war eagles who chose a chance to die in action rather than rot behind prison bars. Hot tempers, liquor, and the madness of war had brought them low—but beneath it all they still were men! The Flight, at is core, is comprised of Bruce Kirby—Below the Rio Grande he had once been known as “The Killer,” now he flew through hell skies, leader of the strangest squadron that ever dared face death from flaming Spandaus; “Big” Durgin, the hugest Jailbird of all, a mountain of a man with pile-driver fists and a fierce, battered face that masked the gruff kindness beneath his hard exterior; “Tiger” Haight, whose dark eyes ever smoldered as at some hateful memory, perhaps of the day which had turned his hair to silver, though he was but thirty—no one knew his past—no questions were asked in the Jailbird Flight; Cartwright, the tall, urbane Englishman who looked like a British lord; the lanky Tinker with his drawling humor and comical, homely face; and last and by no means least—Kid Denison who reminded Kirby of his ill-fated young brother who had been brutally sacrificed by a drug-mad S.C.! 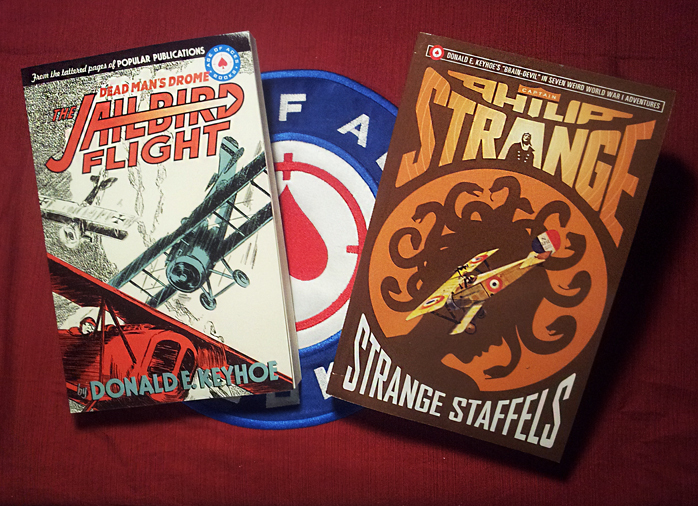 We also have our fourth collection of Captain Philip Strange—Strange Staffels! America’s enemies have assembled squadrons of flying furies, exploding skeletons, and invisible airplanes to turn the tide of the First World War. But when things get weird, we get Strange. Captain Philip Strange, that is—ace pilot and so-called “Brain-Devil” of G-2 Intelligence. His assignment? Journey from the backalleys of Paris to the skies over Germany, taking down flying fortresses, cursed aerodromes, strafing skulls, and other wild weapons of mass destruction!